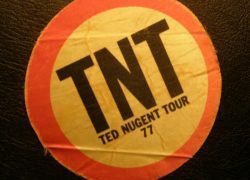 Item description: Roadie stage pass for the 1977 Ted Nugent Tour. Satin circular pass screen printed red and black. Condition report: Used. Overall very good condition. 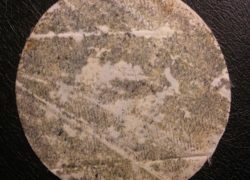 Backing paper removed. 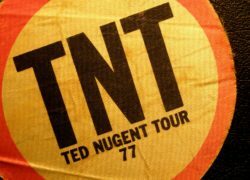 Background to Ted Nugent: Ted Nugent American musician, singer, songwriter, and political activist. Nugent initially gained fame as the lead guitarist of the Amboy Dukes, a band formed in 1963 that played psychedelic rock and hard rock. After playing with the Amboy Dukes, he embarked on a solo career. Noted for conservative political views, Nugent has taken a lifelong stance against drug and alcohol abuse, along with the advocacy of hunting and gun ownership rights. He is a board member of the National Rifle Association and a strong supporter of the Republican Party. Nugent has released more than 34 albums and has sold a career total of 30 million records. He was known throughout his early career in the 1970s for using Fender amps, a large part of his signature sound, and for playing the hollow-body Gibson Byrdland guitar. He has been performing since 1958, and touring annually since 1967.